When they’re shaping it and also when they carving it, they boil it [horn] and get it soft, and then they carve on it until it starts to harden up again and then they boil it again in the water. When they’re shaping the ladle part of it here, it’s boiled…and placed in a mold; then another piece is put on top to let it dry into the shape. The bowl of this feast ladle was heated, carved, and molded is from the horn of a mountain (Dall) sheep. 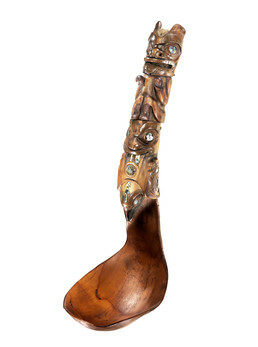 The handle is also horn (possibly from a domestic cow), intricately carved and accented with abalone shell and copper. The carving represents ancestral clan crest animals, Beaver and Raven.